at a fundraiser for Galloway MRT. My grand kids were heading home to England on the same day so I am glad my mind was on the drive as I miss them so much. The roads were clear the sun was out and the hills still had plenty of snow high up in the gully’s. from Galloway MRT. It was then over to my sisters for tea an hours break and my nephew then drove me back into Ayr early to meet the Provost and Lord Lieutenant it was kind of them to come and get a bit more information on Mountain Rescue. We had a good crowd in the hall and the night started with Galloway MRT who cover Ayrshire speaking about what they do and their team. The kids had given me a cold And a sore throat but I managed to chat and we split the night into two halves with a raffle for the team funds. I managed to keep my voice going and I hope I spoke enough about what the Mountain Rescue Teams do and the time they and their families give up for others. Behind every team member is a family. The Galloway Team were at Lockerbie in 1988 along with many other Mountain Rescue teams and SARDA. I spoke about the trauma of this and other events and it’s effect on me, my family and some of my friends over the years. It’s good to see how things have changed and what a great job the Mountain Rescue Teams do. Not just in the mountains but as part of flood relief, big snows and searching for vulnerable people, This is all done as unpaid volunteers and it was good to highlight it to the audience. Ayr is where I was born started on the hills and where my Mum and Dad brought me up. It was a great honour to speak in my home town and pass on a small bit of what Mountain Rescue means to me. I dedicated the chat to my Mum and Dad and my family my nephews were there and it was an incredible night. I spoke about looking after the environment and my Cycle to Syracuse last year on the 30 th Anniversary of Lockerbie. The team I went with and meeting the families of those who died. The great folk of Lockerbie and surrounding area who did so much for us all. These are the true heroes who never get spoken about the Mums, Grannies who fed us and gave us great kindness that I will never forget. The efforts of the Mountain Rescue Teams the Police and all the other Agencies involved. I was emotional as I spoke about the relatives who said we brought their kids home at last with our cycle. Bouldering with my grandkids and their Dad. It was a great night for me full on from 0600 to after 2200. My nephew drove me back and we got the final 15 minutes of the football a real cliff hanger. It was good to unwind good to meet so many kind folk and good to be able to publicise a bit of the great work of the Galloway MRT. 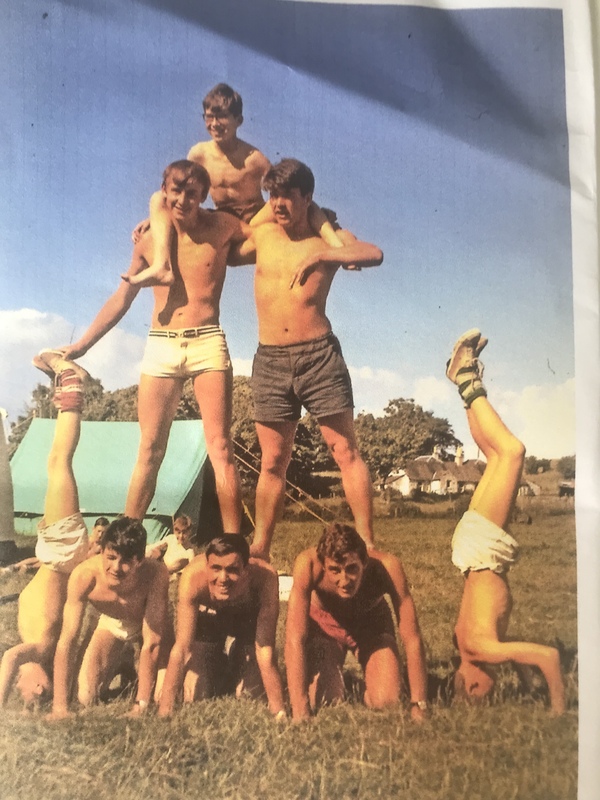 Boys Brigade camp 1966 ! The early days on the hills and the Boys Brigade meant a lot to me I was given the route we did in 1967 and two old photos last night. They made my day thank you very much. These early Walks gave me a love of the hills that stay with me for life. Spot me ? Dad with shirt off. As you get older you look back a lot on the past and how it shapes you. The media is full of sadness and bad news yet as always there are so many good things happening. Galloway are out today looking for a missing person there always there to help and it was great to meet the team and the Police who attended the talk. Today I head back via Glencoe to see a few pals. I am so fortunate to have been surrounded by some great good folk all my life. As I was packing up I got a old route I did in 1967 as a member of the Boys Brigade Duke of Edinburgh Award from one of the boys who lead it. All those years ago in the Galloway hills an epic 50 miles in 3 days. That made my night, thank you all. My granddaughters are up from down South they are only young yet so wise already about the environment. They are aged 5 and 8. They are staying locally at Hopeman and living next to the beach. They were telling me about how we have damaged the seas with plastics and how bad we treat the planet. They are pretty wise already about looking after the environment. They are so interested in the environment and ask so many questions about the rocks and the planet it was great talking to them. I wish those in charge would listen to them. Sadly the world is dominate by wealth and the big company’s are in control. They already know we exploit the natural resources and have done over the years. There is so much damage done maybe the next generations can make a difference before it’s to late. Out of the words of babes. I have been invited to speak in Ayr Town Hall next Wednesday. I am speaking in tandem with a Galloway MRT a team this will mean a lot to me as over the years especially at Lockerbie where I worked with them. It’s a great honour to speak with them in my home town of Ayr. I hope that they get a good crowd as all the money on the night will go to the Galloway Team. I was brought up in the town and very lucky we had the beach nearby and plenty of space to grow up. I got my love of the hills from my family in Galloway,Arran and with the Boys Brigade on expeditions. I loved the area and it’s people so it will be good to be back. It was a love of these wild places that gave me a lifetime on the mountains all over the world. Early days with the RAF Mountain Rescue Team. I had a great time in Ayr and owe my family and pals a lot. I was a bit wild then and was lucky to join the RAF and have a good life with the Mountain Rescue for 40 years. I hope I can share some of my tales in my home town. So if you live near Ayr it would be great to see you on Wed 17 April at the town hall. Tickets will be available at the door. I hope to be able to pass on my love of these places some of the folk I have met along the way. Also the many adventures on the mountains and over 1000 rescues. Last night I had a visit from an old pal Terry Moore I had known Terry since 1975 when I was in RAF Mountain Rescue. Manaslu North. Our Joint British Services expedition had 12 members under my leadership. We had 170 porters for the 15-day march to the traditional Manaslu east-face Base Camp. We established Base Camp, Camp I, Camp II, Snow Cave and Camp III at 12,600, 16,100, 18,200, 20,200 and 22,200 feet on April 12, 17, 22, 26 and 29 respectively on the eastern side of Manaslu North. The first summit bid was made on May 1 by me and three others after the weather had turned foul overnight. We set out at four A.M. but were caught and partially buried by a large avalanche, which wiped out the trail and marker poles behind us. We withdrew. Another full-scale assault started on May 4, despite snow so deep that the top of the tents at Camp III were two feet below the surface. After climbing to the north col of the main peak, Pat Parsons, Charles Hattersley, Terry Moore and Doug Borthwick reached the summit (7157 meters, 23,481 feet) on May 10 at 12:10 via the kilometer-long, technically difficult south ridge. We believe this to be the second ascent of the peak and a new route. When they got back to Camp III, they discovered it had been swept away by an avalanche. They finally found shelter at the Snow Cave after 20 hours on the move. Three peaks between 18,000 and 20,000 feet were climbed after the main assault. Terry and Dougie 35 years on! They also told a tale of an winter ascent of Clach Glas on Blaven in winter 1982 after the F111 crash on Skye. They were dropped of on our day off working with the USA Air Accident Team by a USA Jolly Green Giant helicopter on their day off. The ridge was in true winter conditions and a magical adventure by all accounts. I was looking for a photo of their day on the ridge and will add it if I can locate it? My mate Dougie has come up with the photo! Bronchitis I had to take a few months off add to that a fall where I hurt my ribs I have been missing the mountains so much . I love the Torridon hills but wanted to have a good look at Beinn Liath Mhor on a good day. This hill means a lot to me as this was where the Gibson brothers went missing last year. It was an awful time for the family the brothers my sisters nephews and were Uncles of my nephew and niece. I searched the big Corrie three times on my own in winter last year it was a wild hard time and it took 6 weeks sadly to locate the last brother. I cannot thank the Torridon, Dundonnell SARDA, Lossiemouth Mrt and other Agencies during the long 3 week search . There was also the incredible help from the SAR helicopter in the search. They never gave up and we so appreciated their efforts. It gives you huge respect for the good on people. These were awful times for the family but yesterday had such a great forecast I would go and try a day on the hill. This time I would take time to look around. Most of the snow should be gone by now! I tried to get some folks to come with me but most were busy. I was glad my pal Kallie and her Collie Islay fancied and day on the hill. They would come and we decided to meet on the day the clocks went forward. We met at the crowded wee car park near Achnashellach Station. We met at 0900 the weather was stunning. There was such a warmth despite some fresh snow on the tops. It was – 2 on the drive to the hills but what a day it was to be. The walk in is superb you cross the railway line and follow the forestry track to the incredible stalkers path. Many trees have been cleared here and the views of Fuar Tholl are stunning what a Mountain. This mountain has an incredible history with Hamish McInnes, Martin Boysen and others explored these incredible cliffs. It’s worth reading of some of the early days here especially in winter. There is still some snow in the gullies that with the shadows outline the cliffs. The stalkers path is so well built we owe the locals who built them so much . They have always been great paths and are wonderful to walk on we must look after them. You seem to gain height effortlessly and the glory of Coire Lair opens up the higher you go. There are lovely broiler plated Slabs of sandstone to walk on in places it’s a geologists heaven here. It was so warm and perfect weather for walking. This would be a special day for us. We took it easy but I wished I had brought sun screen I could feel the sun on my face. There was such a heat from the sun today after the winter and it made you feel so well. We were soon at the Cairn where the paths split and our first top looked steep. We had some drink and a bit to eat and marvelled at this place. photo – Islay waiting patiently for us as she did all day! It’s so good to be out and with no rush just looking at that huge bulk of Fuar Tholl despite being a Corbett it dominates the walk in. I love this Mountain it has given me so much joy walking scrambling and winter climbing in my early days. Local Guide Martin Moran is a man I have so much respect for uses this Mountain a lot and it is a hill few know. Many are to busy chasing the Munro’s. Go climb it ! photo – The only folk we met enjoying a special day. From here it was head up onto the ridge. We met a party of 3 out for a week on the hills. They caught up and we had a chat it’s great that folk take time to enjoy the hill. Off they went while we took it easy. The ground is rough and steep with lots of Quartzite and so many different colours lichen on the rocks. There seems a lot more than normal blues, white and green on the rocks. I searched around here as well last winter there was curtains of ice hanging from the cliffs. The snow then was rock hard and I traversed around the ledges it is no place to fall. The first top was a slog it was hard work but we took it steady. The top is scree covered and it has a big Cairn we stopped took the photos the Panorama is wonderful. The Fannichs, the Torridon giants the lochs and our local Munros. The Ridge to the summit is 2 kilometres long in winter a wild place with no shelter. Today it seemed just a long way for one who has not been on the hill much. There was only a little snow that Islay enjoyed on the ridge I was drinking a lot as it was still warm. From here is the big Corrie where the Gibson brothers had their tragic accident. I had been here alone looking for them last winter. It was bitter cold then the snow was rock hard and had descended into the Corrie it looked so benign now with lots of quartzite scree and no snow. Yet in winter this place was and felt so remote. I had gone on my own and spent some time here it’s a powerful place to be. Soon Kallie was with me and the ridge walk was stunning, narrow in a few places and changed to Sandstone from quartzite at times. I could see where you could slip easily here on a wild day. I was feeling it after not being out for a while but it was such a day and we had so much to look at we took it easy. The ridge opened up again there was a bit of up and down the views of Sgur Rhuadh were wonderful with its great cliff and gullies. I climbed here as well. This was in the past a few times on the Academy Ridge in winter and summer and the big easy Gully. We were soon on the last bit of the ridge it kept on going and the views down to the sea and the lochs were incredible. We had a long break one hill was enough today I have to pace my recovery. We could have descended the screes but headed on to the beleach where you have to be careful of the descent to the small cliffs that are just before the belach. It was a stony descent down more scree then some lovely Slabs but we were soon down at the beleach through the cliffs and could see our path into Coire Lair. We sat on the Slabs and had the last of my drink then headed down after drinking in the views . I could have stayed longer it was so warm and breathtaking. One hill was enough today I have to be careful. The path out was great a bit cut up by the passage of mountain bikes there is lot of mountain biking going on now. You pass such scenery and a massive herd of deer further down . Islay sat and watched them I refilled my water from the wonderful bubbling river. It was glorious water fresh and cool. We were soon down it was a lovely walk out in the sun. We did not rush both felt tired even Islay nearly fell asleep when we stopped. Kallie is very fit and looked fine all day they were great company. I enjoy the hills on my own but today was lovely and to be out with Kallie a well behaved dog was magic. we arrived at the car changed our boots and headed of home. It had been a great day and special company thank you Islay and Kallie. How I had missed the hills! The space the beauty the wild life and the summits. Just to be out was wonderful and the 2 hour drive back was fine. Today I feel it but I was so lucky to be out again in these wonderful hills. ‘It’s been a long time since I visit Culbin Forest I had a great few hours on my bike I had forgotten how great a facility it is . There is a good car park with toilets and it’s £1.50 for 3 hours parking. I never mind paying for facilities like a loo etc. It was very quiet midweek and I saw only a couple of folk. I am trying to get back out on the bike again after a pretty miserable winter with bronchitis. Hill 99 a great view point. There’s a fascinating network of tracks to explore and the level ground makes it easy. There are great views and the hills are all shown on wood on the Tower. Scotland’s Sahara From the notice board in the car park. The land had been reclaimed by the forestry and it’s a great story as in the past this area was known as Scotland’s Sahara where the the sand dunes were huge. It’s an amazing place and once you get out onto the marshlands it’s incredible. The tide was out but the Glider poles were prominent in the estuary. There were few birds about must have got there at the wrong time. Yet it is a place of great space very little rubbish about and I had lunch here. Poles in the sea Evidence of Culbin’s wartime role There is little visible evidence of wartime Culbin today, although the beach sometimes reveals pieces of rusting shrapnel. Many people do not recognise the most enduring feature of the wartime landscape here. Look out over the Gut and you will see it is dotted with regular lines of poles. These were deliberately erected to avoid enemy gliders from Norway landing here. Fears of espionage and invasion were very real in those times. I enjoyed the break here the grandkids would love it with the Forest and the water. It’s an easy place to get to just outside Forres and once I get fitter I will cycle here as there is much to see. I am looking forward to seeing the birds and wild life. I enjoyed it was a lovely few hours out and I was reminded of this place by a BBC podcast on the Culbin Forest. It is well worth a listen. Various local experts take you round this place and tell the amazing stories of the Sand dunes, the afforestation, the people, wartime use and the wildlife. I enjoyed the trees the silence and then seeing the sea. The views from the Tower and the hills standing out the cover of trees and with the sun it was wonderful. I will be back this is another superb facility in my piece of heaven called Morayshire. Yesterday I had to get out and had a short wander along the local Dava Way. There is a bit of work going on with a new pipeline going in from a local distillery. The path is in great condition and lots of work going into it by the distillery. It’s a magic place following the old railway line and sheltered in places as yesterday there was a bit of wind. I hardly visit here and have missed out on my local area but this is a lovely walk and the volunteers who look after it do so well. Thank you all. New footpath not far off completed! Just closed till path completed Health and Safety? We had a great 2 hours enjoying the sun and it was lovely to get out again. I will cycle this route this summer I promised myself last year that I would do it. Imagine when there was a railway here and how wonderful that would be today. Yet we have a great route the Dava Way how lucky are we. The Dava Way path links the historic towns of Forres and Grantown-on-Spey. Almost all of the route follows the old Highland Railway line and is off road and safe from traffic. Along its length it passes through a pleasant mix of farmland, woodland and moorland. The Dava Way is a great off road cycling route. The surface is firm for most of the route but it is often rough and front suspension is definitely recommended. This is a pleasant and easy route. The surface of the path is generally compacted railway track-bed material, rough and rutted in places, and is good for walking and off road cycling. It offers a variety of landscape, flora and fauna along with natural and railway heritage. It is about 40km to Grantown-on-Spey from the centre of Forres. Starting your journey from Forres; the Dava Way begins at Mannachie Avenue some 2km from the town centre. A network of sign-posted paths through the various woodlands surrounding Forres, from Grant Park and the Sanqhuar Pond all lead to the old railway and the start of the Dava Way. Thanks to the Munro Society Anne Butler for this update. The Munro Legacy Exhibition opened yesterday. Ex President Stewart Logan was interviewed by STV News and there was an excellent turnout from interested visitors. The exhibition is at the A. K Bell Library in Perth until 18th March. Liz Smith MSP is leading a members debate at 1700 on Wednesday 13th March 2019 in the Scottish Parliament to mark the centenary of the death of Sir Hugh Munro. Liz is a Munroist and a member of The Munro Society. This debate is open to the public who can obtain passes at the main desk in the Parliament prior to the debate. Liz’s motion reads: Motion S5M-15678: Liz Smith, Mid Scotland and Fife, Scottish Conservative and Unionist Party, Date Lodged: 01/02/2019. Centenary of the Death of Sir Hugh Munro. “That the Parliament recognises that March 2019 marks the centenary of the death of Sir Hugh Munro; acknowledges that he was a founder member of the Scottish Mountaineering Club, eventually becoming the club’s president; understands that Sir Hugh was the first person to publish a list of all of the mountains in Scotland with a height exceeding 3,000 feet in the club’s journal in 1891, which are now known as Munros; notes that it remains a popular hobby among hillwalkers to aim to climb every Munro in Scotland, and recognises that over 6,000 individuals have achieved this feat to date.” Supported by: Richard Lyle, Bob Doris, John Mason, Alexander Stewart, Kenneth Gibson, Maurice Corry, Stewart Stevenson, Liam Kerr, Bill Kidd, Murdo Fraser, Bill Bowman, Jeremy Balfour, Miles Briggs, Jamie Greene, John Scott, Annie Wells, Rhoda Grant, Tavish Scott, Gordon Lindhurst, Clare Adamson, Alexander Burnett, Angela Constance, Fulton MacGregor, Maurice Golden, Donald Cameron, Maureen Watt. Updating your skills for the older mountaineer? I was asked by an older pal the other day “are there any courses that can update your winter skills if you have never previously attended an official winter skills course”. I have been asked this a few times by folk in their 40’s, 50’s and above who have returned to mountaineering after the family have grown up. A few find that things have changed a bit and want to brush up on their skills.I know you can hire an instructor/ guide for a bespoke course. I wonder if anyone else has used this type of course, do Mountaineering Scotland do training or updates for this group? If you look at the accidents recently there seem to be a lot in the 50 and over age group hill walking? Things like Avalanche training, the use of GPS etc have advanced so much as are the incredible advances in weather and avalanche forecasting. There are so many great instructors out there and I am sure a few may want a bit of a refresher? Yesterday was a special day for my nephews daughter Beth she was awarded the Baden Powell Award for Guides In Beith surrounded by her family and friends. I was honoured to be asked to present this to her and speak to the Guides and their families. My family have always been great supporters of the Guides with my sisters all being in them. My mother who was President of the women’s Guild used to help them with their badges I remember that as a young lad! My sisters Jenifer (sadly gone ) Rosemary and Eleanor in their Guide uniforms. I drove down yesterday a 5 hour in Summer weather to Ayr my home town to spend a few hours with my family. I had a catch up with my sisters then had a superb tea before heading to Beith where the presentation was to be awarded . I managed a short walk along the beach as well then a quick change and we were off. It was a fun evening the Beith Guides are a great group and a credit to their families and leaders. It is amazing to see and hear about the effort involved in gains the highest award in Guiding and it was a lovely night. You will need to complete ten clauses (tasks) that will get you to try new things and push your boundaries – it’s not easy, but it’s worth it! The more creative you get with your clauses, the more of an adventure it will be. The Baden-Powell Challenge is divided into five zones, each containing lots of different clauses. You should do one clause from each zone, then five more from any of the zones – ten clauses in total. Up to two of them can relate to Country/Region or Girlguiding initiatives. Beth did so well in her long journey to achieving this award and tested herself at times well out of her comfort zone. Beth is very unassuming and a lovely person to be with I was as the family were of her achievements. After the presentation I was asked to give a wee chat. I spoke to the girls and mentioned a wee bit about working in a team and also about special folk I had met in my life. People like Jenny Graham the round the World cyclist , Di Gilbert and Heather Morning mountaineers and special folk you are lucky to meet on the hills. The lassies in the Mountain Rescue Teams and SARDA who have made so many changes into Mountaineering and sport and life since my early days in what was mainly a mans world. We spoke about the environment and looking after it and hopefully doing a better job than we have. I mentioned our Cycle to Syracuse in the USA where we met so many great people and the team I went with. That in life you may see bad things but there are so many good folk about that never get spoken about. Its also good to be able to talk about things that upset you and always speak to someone you trust. The girls were great two new girl guides did their promises and it was amazing to see the enthusiasm of them all. I was given a donation for Assynt Mountain Rescue which was extremely kind and left feeling it was well worth the long drive. The World is full of some many good folk who try to give the Youth of today a start in life. It was great to be surrounded by young folk and maybe pass a little on to them about life and how they can make things better. Well done Beth and the support she has had from Sally and Scott and the Grandparents family and leaders . It was a special night. Thanks to all the parents who came and support their kids and of course a big well done to Beth and all her leaders Audrey and the other volunteers in the Guides. Presenting the cheque from the Guides to Assynt Mountain Rescue Team . Thank you . Good days with companions on a great hill Suilven. This photo was taken on Suilven in Assynt a few years ago with Kenny Kennworthy and Martin “Raz “Frew both were my Deputies at RAF Kinloss MRT and Martin was Deputy at RAF Leuchars. These are great guys when this photo was taken when we met on the beleach on the ridge as Kenny and John Cosgrove had kayaked in from Elphin. Myself and Raz had walked in from the normal route and had a fun day. What a great hill and if you climb both tops it’s a classic day the lower top is interesting. However you climb it it’s a magical day out and we had another superb day. it as such a classic hill and stands “Castle” like on the open moors. It is a great Mountain in winter a classic traverse. On another day a few years later we set out on New Year’s Day Ian “Ned “Kelly had been on night shift in the ARCC ( Rescue Centre at Kinloss at the end of a 4 day shift run) so we drove up North on so quite roads to Assynt. The plan was to stay the night at Suileag bothy and we arrived in the dark. I had never stayed the night there before and it is in a great situation. There was a big group at the huge Canisps Lodge as we passed by on the road. It looked an incredible place to spend the New Year period. We were heading for a bothy a few miles on it was a starry night by now and bitter cold. Normally for a bothy especially in winter I carry in some coal but was expecting there to be some fuel there . I even told Ned there would be. How wrong was I and all we had was a fire log with us. There was no wood at all. I had a look around and found some coal or what I thought was coal in the ashes dumped near the bothy. Sadly it It was a bitter night and the coal never took . It was – 15. Ned only had a small sleeping light bag and froze. I was in my RAB from Everest so slept well. We were off at first light in a stunning morning and had to use crampons on the grass ! It was frozen solid and had a Day never to forget. The views all day were wild of the Lochans, sea and mountains. What a hill to be on especially at New Year. We met a large group as we descended from the Lodge they would be late off. We had a long journey ahead it was then head of pick up the gear from the bothy and then drive back on empty roads. A great two days in good company and superb memories that keep you going in life when things get tough. Yesterday was a great day I headed along the coast to Cummingston it was so warm and I enjoyed getting next to sea sitting on the rocks and enjoying the sunny weather. I looked up and the sky had a pink glow at first I thought it was a cloud but it was smoke . The Skye had a red hue it was stunning but I knew something was up. The cloud had changed the sky. There was a big fire locally near a wind farm and though many miles away the sky had darkened. There was a wild fire at a wind farm at Knockando. There will be lots more wild fires with wild life lost sadly and as the ground all over is tinder dry we must be very careful. Just seen a post that North Wales has problems with wild fires it looks awful. We had had a long first day and camped in a “perfect” location. The rain had started at 1930 that night it had been a long day for the group of 4 including me as a 14 year old. 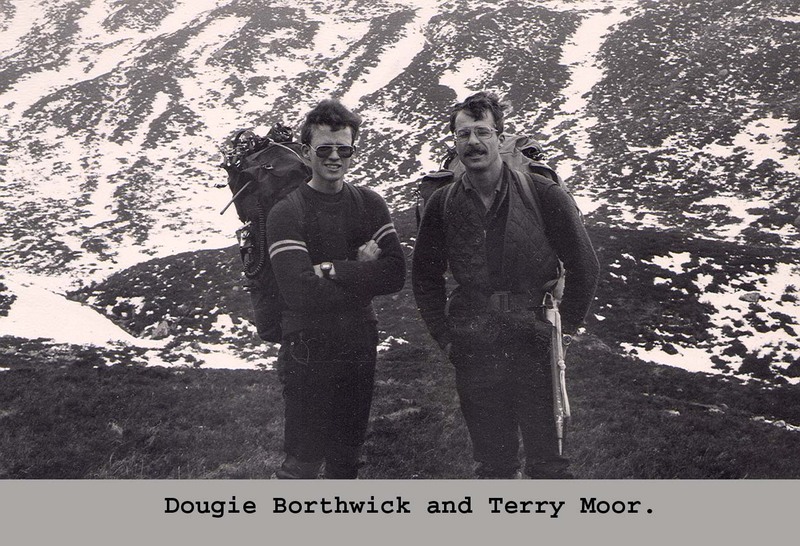 (Myself and my pal John Gibson would do two days each) were there for two days each to make up a group of 4 on their Duke of Edinburgh Award 50 mile expedition. We had put up our tent about 20 feet from the river and made tea when our Primus stove had packed in a washer had perished. This was a disaster as the small Gas stove would not cope. Luckily a car rumbled over the new bridge and the driver was asked to call Ayr and get a replacement coming out the next day. We would be changing over the young ones me for John Gibson at Loch Enoch. This was already planned and the assessor would meet us. We were both to young according to the powers that be to complete the 4 days. This was 1967 before mobile phones and easy contact. We packed into the tents then it rained heavily from about 1930. This perfect campsite was where all the rivers fed from the Lochs joined the Carrick Lane and fed Loch Doon. During the night it rained even more then the tent pole broke and things got worse. Waking up soaked in the middle of the night the water was now 3 feet from the tent.There was no option but to get out. I can remember that night we were lucky that we grabbed what we could in the dark and headed for higher ground. Seemingly I said “that we would soon be floating away in in our sleeping bags” just before we left the tents. According to the write up our torches were pathetic yet we found a building outhouse about 3/4 of a mile away at 0515 where we tried to sort out our gear. We hardly slept and got out our gaz stove and waited for dawn. Unable to sleep two of the boys went back to the tents which were under water and brought some eggs and food back from the higher ground. We met the owner of the outhouse we had moved into and he offered us help but we had to move on to Glen Trool. It was then back to the tents the rain had stopped we packed up all the gear soaked and headed off to the Head of Loch Doon. We met a gentleman who lives alone at the head of the Loch. He advised us to keep West of the thundering Gala keeping as high as possible as it was so wet. After passing the Sloch we altered the route following the first stream up Mullwarcher and kept round the West of the hill. This was roughly the level of Loch Enoch and was exhausting ground. It was steep and full of boulders. We managed a short dinner once we were past this it was well needed and the ground got worse. We were behind schedule now but we’re so glad when we could see a figure at Loch Enoch on the far shore. Hopefully this would be our assessor with a stove ? This is hard ground no paths then and we were soaked carrying wet tents wet gear and so hungry. We travelled the last to Miles as best we could the light was fading and it was now 1700 we met our Assessor Walter Ballie at Sharg cottage. Walter had brought us a stove and was taking me back he was being replaced by John Gibson in the morning. Myself and Walter still had to walk to Glen Trool a long, long way for an exhausted 14 year old . Time was not with us it was dark soon so we left the boys with the new stove soaked but still up for it. It was a finish in the dark for me and I bet I slept all the way home. What a few days on the hill. The walk out a long way. It was great to get this part of the tale the boys still had two days to go poor souls. Yet looking back I remember bits of these two days. They would say “Character building ” yet I loved it even the getting wet the lack of sleep I was hooked. I received this in an email yesterday. “I was team leader and founder of RNAS Lossiemouth MRT. We were never part of Kinloss MRT as a sub unit,but an individual unit often working with Kinloss. We were on the “Call-0ut” list and went independently to incidents. I was also on the Scottish Mountain Rescue Committee and occasional instructor at Glenmore Lodge. RAF Mountain Rescue Team Badge. I remember some of the Navy Lossiemouth Team our with us at Laggan in 72? The RAF Kinloss MR Team moved to RAF Lossiemouth after Kinloss closed In 2012 and is the only RAF MR Team in Scotland. There are two other RAF Teams at RAF Valley in Wales and RAF Leeming in Yorkshire. Anyone got a photo of the Navy team at Lossiemouth?. After I gave my talk in Ayr On Wednesday I was given some photocopied papers and two great photos at the end of a long day. I had driven from home to Ayr that day 4 hours and set up barely had some good and onto the hall for 1830. My head was pretty fried and I am not sure who gave me them but it was one of the group named above. This wee piece of paper means so much to many thanks as this is a great addition to my memory of walking in the Galloway hills as very young 14 year old. I was in the 7 th Ayr Boys Brigade at the time and a very small skinny lad. I look back at it and the memories come back just. I think my head hard drive has forgotten so much due my crazy life in the mountains? Yet when I read the account that I was given it’s in great detail. I was the youngest along with John Gibson and we made up the numbers. We only did two days each I did not remember that bit amazing-how the memory is so hazy. The Duke of Edinburgh Expeditions had to have 4 for safety we were pretty young the others were all about 16. We carried the world on our backs the gear was heavy but I was so excited about this trip and so proud to be making up the numbers. I loved the hills and camping the stoves and the physical effort involved. Some of the boys on the trip me at the top yes that wee guy. The diary was so incredible it describes the journey in such detail. I think David Hamilton did it it’s so eye opening . In these days there were no mobile phones, GPS and all the gear was heavy. We had trained for this 50 miler and as the youngest I think it was hard going but we were all so excited, we were getting a chance of going out with the big lads. Looking back it not a big walk but the ground is so rough and lots of plantations with the forestry. Add in our youth the big bags and the weather it would be an adventure. 1967 day 1 DOE Expedition. We would be dropped off at Straiton at 0845 after getting dropped off. We had a tent two stoves and food for 4 days and 3 nights out. It would be big bags for a little lad. I cannot remember much but the report says it was windy as we headed up to the memorial to the Crimean War above the village where we had a break out of the wind. It was then set off for Knockdon farm over a fairly undulating piece of countryside. The report says it was hard to keep to our route. By 1045 we passed through the farm and on up the path to Loch Bradan where we had lunch at the waterworks. From here it was tough ground to Loch Brechbowie from here to Loch Bradan it was soggy and wet walking. From here we followed the high ground and saw great views of Dalmellington and the Merrick. The remaining part of the day was clear to us. We passed Loch Goosie and the head of Loch Doon just visible to the East. We scrambled down the drainage ditches and the Loch levels were fairly high at the dam. (This would prove to be costly later) We made camp at 1630 at the new Forestry Bridge where the Carrick Lane meets Loch Doon. The campsite was good flat and some 20 feet from the river. The weather has been so far dry and we thought we were in for a good night. Yes it was all going so well it was Friday 13 th and anything can happen. After our meal we tried to heat some water for washing up whereupon our Primus gave up the ghost. The washer on the plunger had perished we had one Gas stove in total and we felt rather helpless. Life was to get worse. We heard a vehicle at 1930 rumbling across the New Bridge and we managed to ask the driver if he could make a phone call from Dalmellington for a new stove to our contacts in Ayr, He was so helpful and would not take any money for the call. No mobile phones then and what a kind man. It had started to rain at 1930 and things would change – to be continued. ‘Primus’, (Latin for first), appeared to the World. pressure camping stove. In 1962 the paraffin division of Primus was sold to Optimus but continued to manufacture stoves under the name ‘Primus Trading’. The Company was closed in 1972 and the range consolidated just to Optimus models. 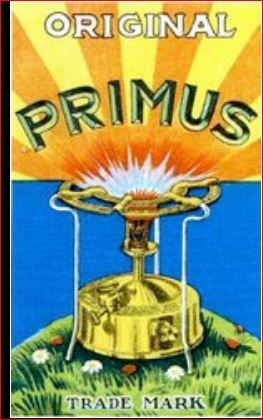 In 1966 Primus joined with one of their rivals, Sievert, and concentrated on L.P.G., (Liquified Petroleum Gas), camping stoves as well as blowlamps. In 1997 Primus re-entered the liquid fuel stove market with some excellent designs of multi-fuel stoves still available today. The Optimus Company had also been making a range of stoves since the late 1890’s and continued the traditional paraffin stove right up to 1996 when the range was gradually withdrawn to concentrate on the range of Petrol, (Gasoline), and multi-fuel stoves manufactured today. The basic Lindqvist burner design was copied by manufacturers all over the world, many adopting the same method of numbering their models by the burner size and style, ie. 00, Nol, No5. This variation in models makes stoves appealing to collectors, some prefer to find one model from many different manufacturers, some try to collect every model from one manufacturer. Further interest is added by long running models ‘evolving’ over the years. A glance down a list of some brands shows the wide choice such as Monitor, Burmos,Parasene, Buflam, Valor, Royal Standard, Thermidor, Kenrick, (U.K.), Optimus. Radius,Primus, Svea, Prince, (Sweden), Coleman,(U.S.A.), Meva, (Czechoslovakia), Metacel,(Australia), Petromax, (Germany), Hipolito, (Portugal), Anchor, Shinabro, (China),Manaslu (Japan). Gas runs out so eat cold food out of tins. Modified rucsacs too as you learn they crap. Put corks on string round old wide brim hat & throw off as a pain & put up with midgies 🤣🤣 could go on & on. I am preparing for my chat in Ayr tomorrow. In the town Hall. Hopefully it will go well and Galloway MRT will raise some money for the team. I was brought up in Ayr and the town means a lot to me. I have worked with the Galloway team in the past and they were one of the local teams at Lockerbie in 1988. I spent a lot of time in the Galloway hills, the Merrick, Corserine and the wonderful hills were all part of my early days on the hills. My father took me often and with the Boys Brigade I did several Expeditions as a very young boy. It’s also the last day I will see the grand kids as they head home on Wednesday. Today we hope to have some fun and you need not go far for that. After that it will be an early start and I am looking forward to talking in my own town in Ayr Town Hall tomorrow at 1930. It’s a long journey as I am not leaving till Wednesday morning early.